Our Kind of Cruelty was one of my most anticipated reads of 2018 and although it really wasn't quite what I was expecting, it was undoubtedly all consuming and unforgettable. Yes, this story is as toxic as it sounds! This is an unsettling tale of toxic relationships, toxic emotions and toxic characters. With Mike, Hall has delivered one of the most fascinating and unnerving protagonists of 2018 with a narrative voice that is so unlikeable yet so strong and well written, his story is impressively compelling. Our Kind of Cruelty, (great title too, as multi layered as the plot! ), is about dangerous games, the power of love, obsession and the lengths someone will go to in the name of love. It's a dark exploration of the way our emotions can take over and control us and how easily situations, remarks, conversations and behaviours can be misinterpreted, or re-interpreted, to suit the blind belief and feelings we have. Ultimately it's also about the danger of games and the fatal consequences of dares if they go wrong. As I said, toxic. For the reader, there is a jigsaw to put together, and plenty of questions of trust and reliability to contemplate as the story unfolds. Hall's masterful handling of Mike's narrative is so well executed and so convincing that the tension and suspense remain palpable until the very last sentence. His voice is one of the strongest and most impressive parts of this novel and Hall's ability to write so convincingly from a male's point of view is commendable. I loved the way that the sense of danger slowly builds; the precariousness and possible truth suddenly dawning on the reader once you are so fully ensconced within the novel that there is no way out of this bleak tangle of raw emotion. Hall's skill is in only showing us his side of the story and she constantly tests the reader's empathy and challenges their relationship with Mike. It's bold, daring and completely effective. Despite the high dosage of toxic in these pages, it is a very readable novel, and a page turner. The level of detail provided by Hall allows you to become immersed in Mike's emotional journey and ultimately this is a psychological thriller but one with a twist - or shocking finale - that is unconventional and yet full of impact. Hall's writing is polished, accomplished and full of dramatic effect. Her inclusion of clever motifs like the eagle necklace, which carry much more sinister implications, are very well handled and a great way to add more tension and sense of impending threat. She is a writer to watch out for. This is a book that makes you feel uncomfortable when you are reading it and will make you shudder when it's finished and you can't quite leave the characters behind. I can't include spoilers, but I enjoyed the final section and thought it a clever plot device which once more was very well handled. Our Kind of Cruelty is a complex, intricate and unsettling read. A slow burn with a powerful blast in the final twist. 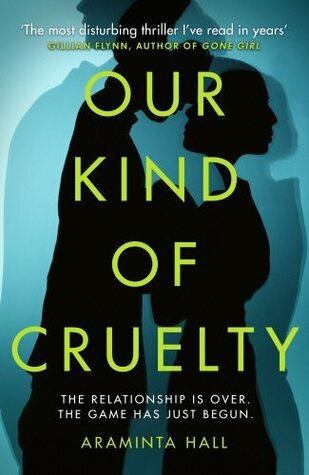 Our Kind of Cruelty was published on 3rd May 2018 by Random House. My thanks to the publisher and NetGalley for an advance copy of this book.